I am so glad my mom was in town to help me with painting his room. 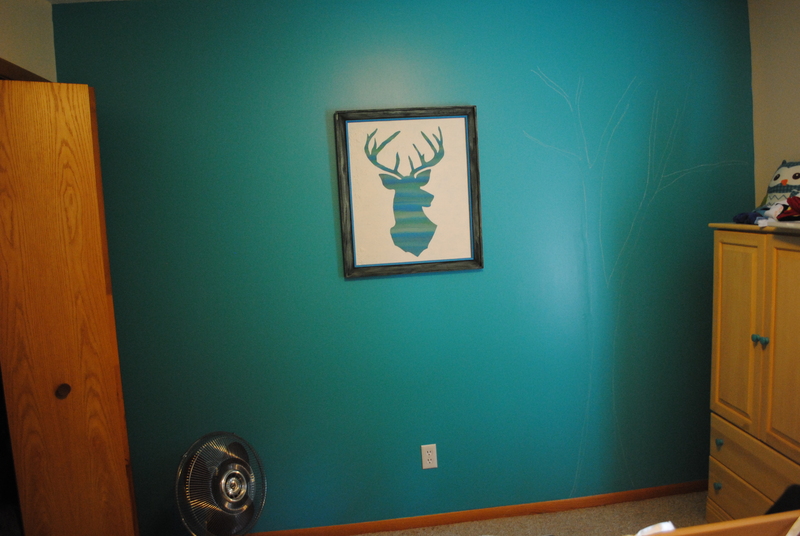 His room looked fine the way it was- with the teal wall and then the deer head picture. 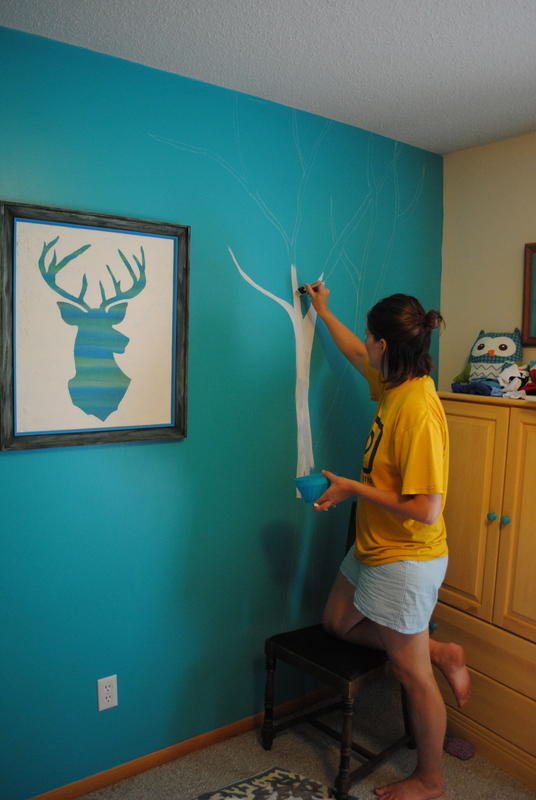 But I was thinking about painting a few trees on the wall but this seemed a bit daunting to me. My mom was the one who told me to use chalk to draw the outline of the trees- otherwise I don’t think I could have done it. It was reassuring to know that if I didn’t like the shape of the tree I could just wipe the chalk away and make the branch go another direction. I wish I got a picture of my mom and I painting this together because it was definitely a team effort. Thanks mom! 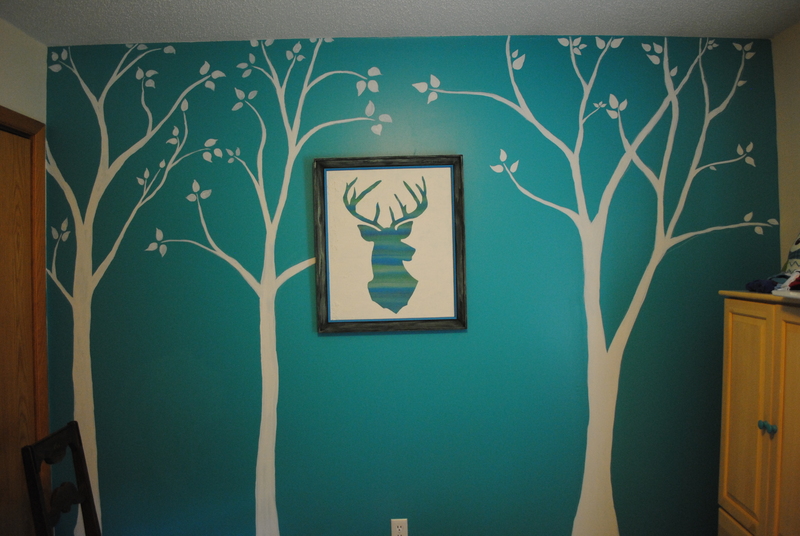 His room is so happy and I love sitting in his room, staring at the picture and trees while nursing him to sleep. He is already four and a half months, can you believe it? I can’t, not at all. Loving this little boy and loving his new room. His crib now sits underneath the picture and he can lay and look at this beauty of a wall when we wakes up. I’m so glad we just got going on this. It turned out so beautiful. What a wonderful, peaceful and personal room it turned out to be for precious Hudson. It was interesting to paint together. I think how it looked when we stood back to look at our progress and realized we had two distinct styles so we then had to switch sides to make it all blend together! Very fun day with a huge payout on a two hour project!